Instrumentation failure during any surgery creates a panicky state and triggers our reflexes. A 46-year-old male with right nasolacrimal duct obstruction was undergoing endoscopic dacryocystorhinostomy as per described standard technique under general anesthesia. While making the lacrimal sac flaps, the endoscopic light source (120 W, Hospiline Equipments Private Limited, Delhi, India) suddenly got extinguished and stopped working. With no standby light source, we thought of using surgical microscope's (Carl Zeiss Meditec AG, Germany) LED light source. The light cable could be easily detached from microscope and plugged into 0° telescope after removing its black tip at the end of the cable [Figure 1]a and [Figure 1]b. There was no overheating of telescope with the use of light cable. Operating microscope's light source consists of 100 W light bulb and has 1600 lumens intensity, which was comparable to LED light source used in our endoscopic system (120 W light bulb). Surgery could be completed with the help of light source assistance uneventfully [Figure 1]c and [Figure 1]d.
Ali MJ, Psaltis AJ, Murphy J, Wormald PJ. 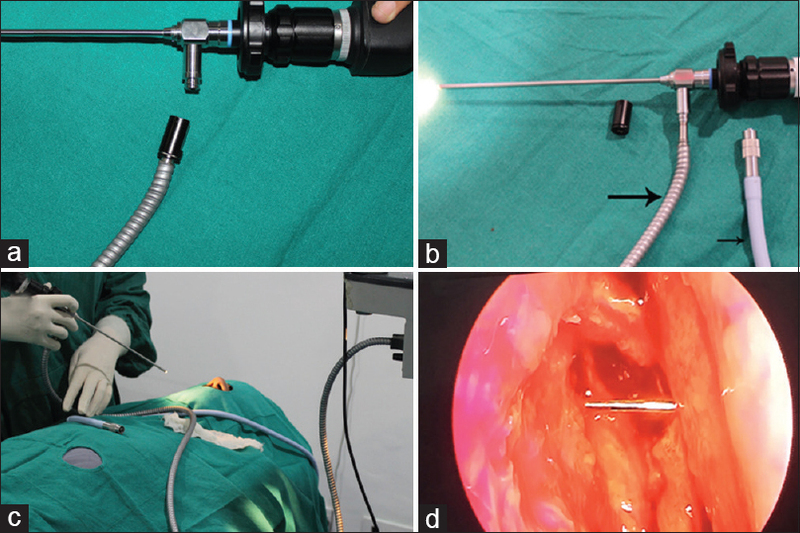 Powered endoscopic dacryocystorhinostomy: A decade of experience. Ophthal Plast Reconstr Surg 2015;31:219-21.